When it comes to portable memory, it seems that there is never enough space nor speed in those tiny flash drives on the market today. Fortunately, there are companies that understand this concern and try to adapt to consumer needs. The SuperCrypt encrypts access to the data while keeping things running smoothly at USB 3.0 speeds. With the promise of transfer rates of up to 240 MB/s and large storage size, does the SuperCrypt deliver? Read on and find out. There are several things that are important about the drive. First of all is backwards compatibility. USB 3.0 is perfectly compatible with older revisions though to get the full speed USB 3.0 is required. Another thing that is important is the capacity. 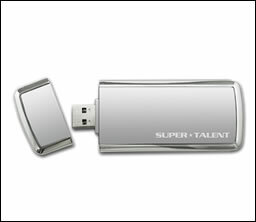 While most drives today come in 4 – 8 GB, SuperTalent decided to start off in the 16 GB range. The drive that we will be testing today is 32 GB in size. Super Talent has a history of listening to our techwareLbs feedback so please feel free to comment you will probably find them very receptive as a company.